Platteville senior Isaiah Oswald returned from a four-game absence and made the game-winning basket with 1:24 left in Friday’s 56–54 SWC victory over visiting River Valley. POSTED January 16, 2019 12:29 p.m.
PLATTEVILLE — Platteville leading scorer Isaiah Oswald couldn’t have returned at a better time. Oswald, who missed the last four games with a badly sprained ankle, made the game-winning layup with just over a minute to play in Friday night’s 56–54 Southwest Wisconsin Conference victory over visiting River Valley in a first-place showdown. 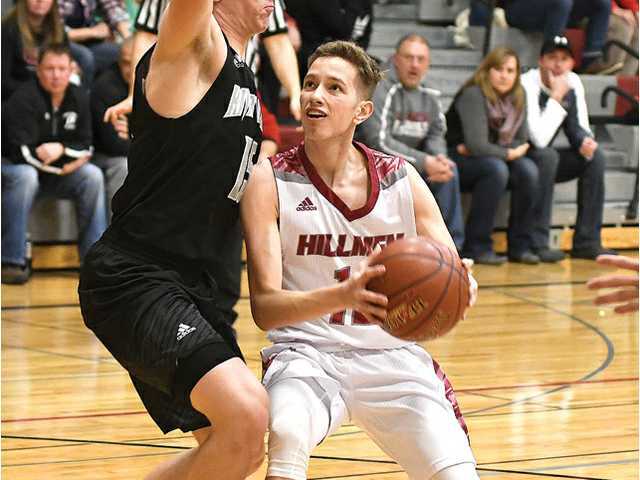 The Hillmen then survived a pair of potential go-ahead 3-pointers in the final minute, and Conner Riley blocked Will Jewell’s shot at the buzzer and Platteville survived for a two-point win after blowing a seven-point lead with four minutes left in the game. Platteville improved to 10–3 overall and 4–0 in the SWC to take over sole possession of first place. The Blackhawks fell to 4–7 and 3–1. “River Valley kept coming at us the entire night and every time we got into a position to close the game out, we just could not get the key rebound or defensive stop we needed to get and to their credit, they made shots to stay within a couple of possessions of us,” said Platteville head coach Mike Huser. Senior Brandon Wiegel’s layup with just under six minutes gave the Hillmen a 51–44 lead and classmate Andy Egger’s clutch 3-pointer from the wing gave Platteville another seven-point lead at 54–47 with 4:39 left. Junior Josh Maier scored in the lane on the ensuing possession for River Valley to cut it to five, then after a Platteville miss, Maier scored again in the paint and was fouled on the play. Maier injured his ankle on the play and had to leave the game, but sophomore Tyler Nachreiner came off the bench to complete the 3-point play, making it a two-point game, 54–52, with 3:29 left. Oswald missed the front end of the bonus on the next Platteville possession, but Wiegel grabbed the offensive rebound and was immediately fouled. Unfortunately, Wiegel also missed at the free throw line and River Valley tied the game on a pull-up jumper by Taylor Knutson on the next trip down court. With 1:24 left, Oswald sliced through the lane for a lefty layup, what ultimately proved to be the game-winner. He finished with a game-high 16 points and three assists. Jewell missed a wide-open 3 from the left wing with 45 seconds left, but the Blackhawks corralled the offensive rebound. With three seconds, left Joe Ryan’s potential game-winner was long. Jewell grabbed the offensive rebound on the right wing 10 feet from the hoop, but his last-second attempt to tie the game was swatted away by Riley at the horn, setting off a Hillmen celebration near mid-court. “Our guys find a way to win close games and I think having been through several of them, they really do not show any panic,” added Huser. “We continued to play and guys stepped up and different times throughout and made really key contributions that may not show up in the box scores all the time. I am really proud of our defensive stand at the end of the game, but we have areas we have to get better at and we will do that moving forward. Platteville scored the game’s first nine points en rout to an early 16–4 lead. Oswald scored seven points in the opening run. The Hillmen led by as much as 15 points in the first half, the last time at 36–21 on a layup by senior Trey Bartels with 2:30 left before intermission, but Valley closed the half on a 8–0 run to make it 36–29. Platteville scored the first five points of the second half to extend the lead to 12, but the Blackhawks made it a one-possession game at 45–42 on a Maier free throw with 10:19 left in the game. Senior Cade Rohrbach (11 points, 5 rebounds, 3 assists), Bartels (9 points), Eggers (8 points) and Riley (8 points, 4 rebounds) rounded out Platteville’s scoring. The Hillmen will travel to Lancaster (4–6, 1–3 SWC) Friday night. They will then host undefeated Darlington (12–0, the top-ranked team in Division 4) Tuesday night. River Valley (4–7, 3–1) — Taylor Knutson 8, Tyler Nachreiner 5, Will Jewell 11, Connor Mickelson 15, Josh Maier 15. Totals – 21 12-19 54. Platteville (10–3, 4–0) — Andy Eggers 8, Cade Rohrbach 11, Isaiah Oswald 16, Brandon Weigel 4, Connor Riley 8, Trey Bartels 9. Totals – 24 4-12 56. 3-point goals — RV: 0, P: 4 (Eggers 1, Rohrbach 1, Oswald 2). Total fouls – RV: 15, P: 20. Fouled out – P: Bartels.